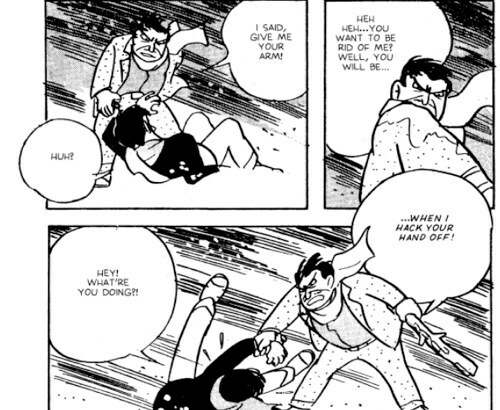 Four-Eyed Stranger #9: The "Anti-Manga Manga"
Along with its fast-paced and noir-influenced story, this lost classic of gekiga offers insights into a transformational artist and his feverish process. Black Blizzard presents a fascinating reading experience. 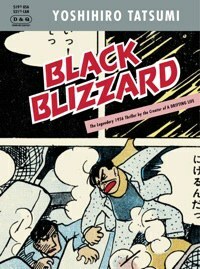 A "thriller-manga" from 1956, and an early example of the gekiga style of Japanese comic, Yoshihiro Tatsumi's Blizzard is also inexorably connected to his 2009 memoir, A Drifting Life. It's hard to read one without rushing to consult the other. An epic autobiographical comic, Drifting Life examines not only Tatsumi's life and development as an artist, but also Japanese post-war society and the growth and development of the manga industry. In several sections, he describes his thinking and ambitions leading up to the creation of Blizzard, as well as the exhausting, exhilarating 20-day marathon creative session that produced the comic. "I'm using the manga methodology to articulate something entirely new," he tells his older brother in Drifting Life. "I've had enough of manga that concerns itself with 'humour' and 'punchlines'! It may be an imitation of film now, but eventually a unique anti-manga manga technique will be developed." Published when Tatsumi was only 21, the hard-boiled and fast-paced Blizzard follows two convicts who escape from a train crash, and who must try to survive a brutal snowstorm while handcuffed together and on the lam from the police. One of the men is a young artist, a pianist who murdered (or did he?) another man over his love for a young singer. The other is an older man, a former card sharp who has murdered more than once, and has spent many years behind bars. Each man relies on his hands for his profession, but the only way to survive may be to cut someone's hand off. Republished this year by Drawn and Quarterly, Blizzard is a handsome product, reproducing the full-colour pages at the start of the tale, just like its original version, and including a fascinating interview with Tatsumi by Adrian Tomine, who also edited, designed and lettered the book. In that interview, as well as in Drifting Life, Tatsumi explains that his inspiration came primarily from The Count of Monte Cristo, with some pulp fiction mixed in. The story bears a slight resemblance to the classic movie, The Defiant Ones, and Tatsumi takes care to point out in Drifting Life that the film would not be released in Japan until two years later, in 1958. We're privy to other interesting scenes involving the story's creation, too. After he finishes the story, and before he sends it to his publisher, Tatsumi shows the book to his older brother, who remarks, "It's like the whole story is made of diagonal lines, and your pacing's become even more cinematic." "I think the draftsmanship is a bit rough, but I've never worked so freely before," Tatsumi replies. "I don't know if this kind of expression is a new technique or just a waste of paper," his brother says. "I do know that it's not manga ... It's not even a picture story." Other artists seemed to agree that it represented a new kind of manga, although they were much less critical than Tatsumi's brother. In Drifting Life one scene depicts fellow manga-ka Masaki Sato telling Tatsumi that Blizzard is "the manga of the future." Not only was the finished product something new and exciting for Tatsumi, but the marathon drawing session that resulted in it also seemed to have a new effect on him, even though he was already something of a seasoned manga-ka before he was even 20 years old. "While working on the scenes of extreme cold, Hiroshi (Tatsumi's alter-ego in Drifting Life) felt so involved that he actually shivered. He'd never felt this way before," the narrator says. "Marathon runners speak of a 'runner's high'...They become less and less aware of the fact they are running, their bodies start to feel light, and they feel free in both body and mind. At that moment, Hiroshi experienced his own version of a 'runner's high.'" "So this is the thrill of creation! 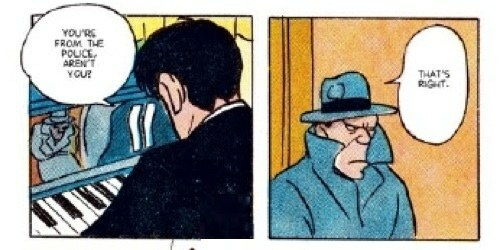 I had no idea," Hiroshi/Tatsumi says. This brings to mind the words of novelist Haruki Murakami, who writes in his recent memoir, What I Talk About When I Talk About Running, "I run to acquire a void." "Sometimes I run fast when I feel like it," he writes. "The point being to let the exhilaration I feel at the end of each run carry over to the next day. This is the same sort of tack I find necessary when writing a novel ... Once you set the pace, the rest will follow. The problem is getting the flywheel to spin at a set speed--and to get to that point takes as much concentration and effort as you can manage." In a fascinating exploration of Blizzard, David Ford compares (on his blog) Tatsumi's creative high to a diary entry by Franz Kafka that described the "fearful strain and joy" of writing a story in a single feverish sitting from 10 p.m. to 6 a.m..
"When I described how Emma Bovary poisoned herself, I had such a strong taste of arsenic in my mouth, I was so poisoned myself, that I had two attacks of indigestion, one after the other, very real attacks, for I vomited my entire dinner." Tatsumi's interview with Tomine at the end of Blizzard describes the "hardship and joy of the creative process" in greater detail (albeit with less emesis). "It leads to a state of mind that could be described as a high, or a sense of exaltation," he says. "I have found that this sort of physical response--this sense of working with your whole body--is not something you experience often." Appearing every other week, Four-Eyed Stranger looks at classic manga reprints and unusual modern work by Asian artists. #2: Unpacking "The Box Man"
#5: The eternal loneliness of "not simple"